NEW YORK - Lisa Borders, who brings more than 25 years of experience in operations, marketing, government relations and public service, has been appointed President of the WNBA, it was announced today by NBA Commissioner Adam Silver. Borders, who served most recently as Chair of The Coca-Cola Foundation and Vice President, Global Community Affairs at The Coca-Cola Company, will lead the world's premier women's basketball league, which tips off its historic 20th season on May 14. She will join the WNBA on March 21. Borders was instrumental in bringing the WNBA to Atlanta in 2008, when she served as Vice Mayor of Atlanta and President of the City Council. The Atlanta Dream has since become a mainstay of the Atlanta sports scene and part of the fabric of the local community. "As a proven executive with a passion for the WNBA and the game of basketball, Lisa is the right leader at a pivotal time in the league's history," said Silver. "She will be responsible for spearheading our efforts to strengthen the WNBA and accelerate its growth." "The WNBA has reached a significant milestone, and I feel privileged to be joining the league at such an exciting time," said Borders. "I have always been a staunch supporter of this league and its tremendous athletes. I am impressed by their talent and inspired by their passion. The athleticism of the game and the sportsmanship exhibited between teams offers clear evidence of our ability to grow women's basketball." Borders has worked and delivered results in all three sectors: public, private and non-profit. Prior to The Coca-Cola Company, Borders was President of the City Council and Vice Mayor of Atlanta, where her duties included managing the legislative branch of government and maintaining the relationship with the Mayor's office during Mayor Shirley Franklin's administration. Among her community initiatives were increasing the availability of affordable housing, addressing the region's traffic challenges, and promoting neighborhood safety and preservation. She was also President of the Grady Health Foundation, the fundraising arm of Grady Health System, Georgia's largest public hospital and metro-Atlanta's premier level I trauma center. She also served as Senior Vice President of Marketing and External Affairs with Cousins Properties Incorporated, an Atlanta-based Real Estate Investment Trust (REIT), as well as President of the Cousins Properties Foundation. Prior to joining Cousins, Borders worked for more than 15 years as a senior health care administrator and operations executive, where she formulated successful long-term operational strategies, financial plans and budget objectives to ensure the organizations met their goals and operated efficiently. Borders' work in the community has focused primarily on family issues in the areas of education, healthcare and housing. She serves as a trustee of Duke University and The Westminster Schools, and she is a board member of Atlanta Women's Foundation, Grady Health System, Woodruff Arts Center and Operation Hope. As a co-founder of No Labels, Borders remains deeply engaged with public policy. 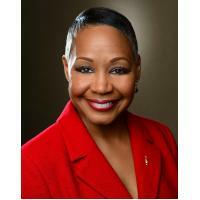 She has received numerous honors and consistent recognition for her corporate and civic work. She holds a bachelor's degree from Duke University and a master's of science in health administration from the University of Colorado.